Firstly: Sorry to hear about your small thing. Secondly: If he edited first post I would need to keep a manual eye on the thread (eg no notification)which I would prefer not to have to do. Also if I were to click show new posts it would not show this thread unless a genuine new post had been made (I pressume). I quite like reading the banter/diary of the progress so far and Input from other users. If it's tedious to read why not just wait for the film. Where can I download BurnPlot ?...I don't see it on the ImgBurn download page. Also, any quick tutorial on how to interpret the graphs ? Thanks...found it....downloaded, ran and loaded a IBG. I attached PNG output of plot from BurnPlot.....any translation would be appreciated !!! I'm just trying to ID whether my burns went/go well on the disc (Verbatim SL DVD-R or DL DVD+R Singapore) without having to run the full movie in the Home DVD player. I'm willing to learn...actually reasonably technical guy....just need a quick guidance of what the plot means. My goal is to look at these plots and say...."Yup or Nope....Burn went well and the disc should be OK for playback, or Coaster and Re-Burn." What are the two graphs themselves ?....what is the 2K, 4K, etc. on right of first graph ? How/Where do I see errors, etc ? The K values should be the amount of KB/sec. 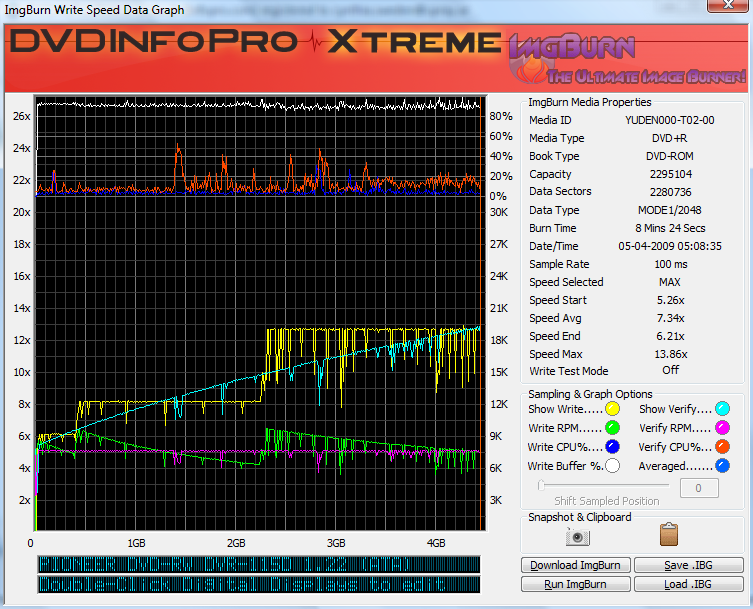 The only issue I can see is the drop in the read line (light blue) at 4GB. A good verify line on a single layer disc looks like an aeroplane taking off. On DL media it will start the landing after the layerbreak. If it looks like an helicopter moving up and down frequently - it's usually a sign of that the disc is hard to read (= bad burn). The yellow line can look very different depending on used burner. In your case the drop downs are most likely the burner slowing down to recalibrate. Looks normal to me. This is how a 'bad' burn can look. That's the purpose of the Verify process, not the graphs. What did the scan look like on that burn Q% wise ? 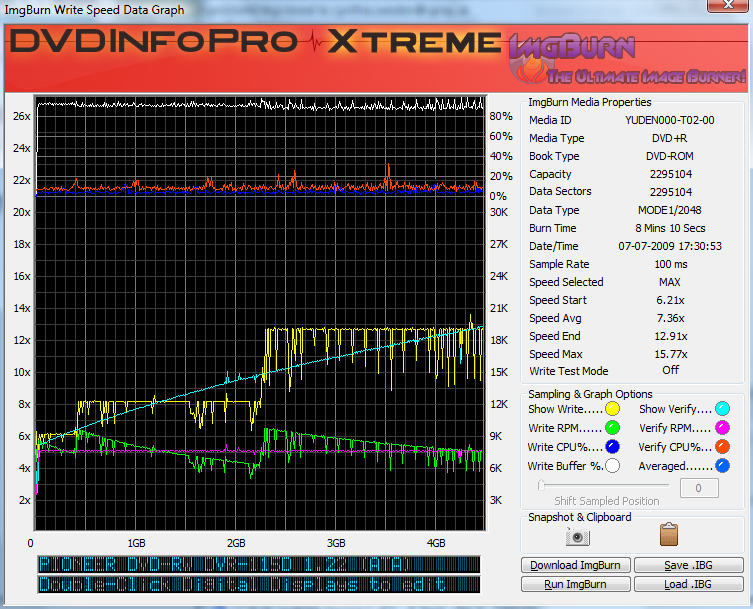 So the disc is spinning at a max of about 10000 RPM during that burn and about 7500RPM during the verify. Redid the burn as I didn't had that disc left. Thanks Cynthia. Out of spec a little but plenty readable for at least a few months if movie for kids dvd player. My DVD players refuse to play these discs. Just skips chapters and pix elates. Surprising .Maybe get a cheapo dvd player like Yamada / Umax . Not sure if those are available at your location. You got a top Brand dvd player ? What is the bottom graph versus the top on my BurnPlot/ImgBurn graph ? The attached program is the first draft and has, thus far, only been tested on Windows XP and with .ibg files created while burning 4.7GB SL DVD's. I made no attempt to make it pretty having only used the standard Visual Basic graphical interface elements, so please, do not expect too much. 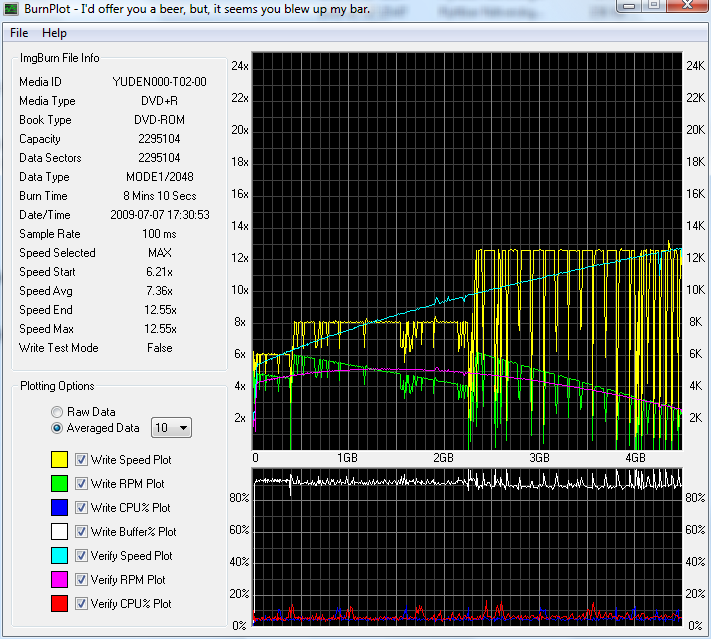 Is there any way to show the disk label ?...is this even in the graph file ?....if not perhaps ImBurn can add ? I ask because I'd like to keep my plots for reference down the road and the IBF name of Burner-Day-Time does not really tell me anything. Obviously, I could rename the file but if this could be included in the display of Media info would be nice. Device buffer % usage, cpu % during write, cpu % during read/verify. Is there any way to show the disk label ? It used to display the volume label so I'm sure that field could be added back in. It might be an idea to default to (or at least via an option) saving the screenshots with the same name as the IBG it has open (only with the PNG file extension instead). 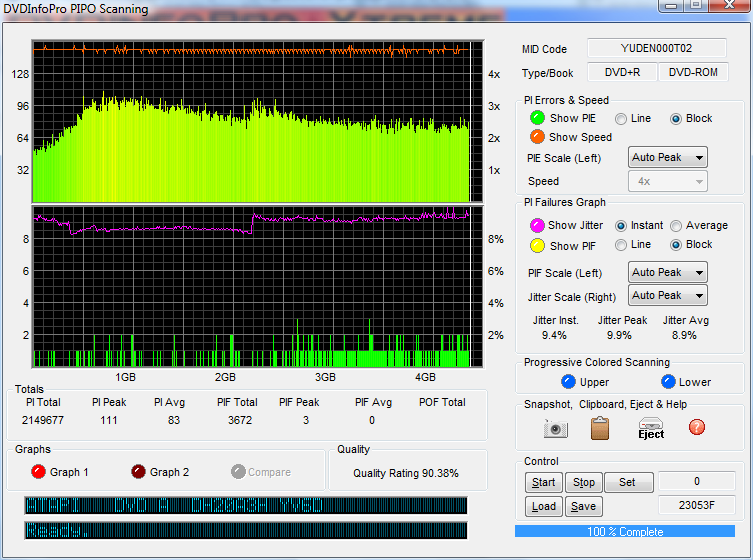 ImgBurn can save the IBG with the volume label included in the file name if you just tweak the option in the settings. I tweaked the RPM plot calculations a bit (Realized they were not responding to the media layer break) and, per Cynthia's suggestion, I have started to work on multiple language capability. As suggested by riahc3 I have edited my original post and added the most recent version to that post as well. @ thekochs - The .ibg files do contain the "DATA_VOLUMEIDENTIFIER" information and this can be added to the Imgburn file info displayed in BurnPlot, but, displaying this information won't change the name of screen capture images which are currently saved as a .png with the name of the .ibg file loaded. As suggested by LIGHTNING UK! you would probably be better off changing the way ImgBurn names the .ibg files so you would not need to rename the .png files before saving. @ LIGHTNING UK! 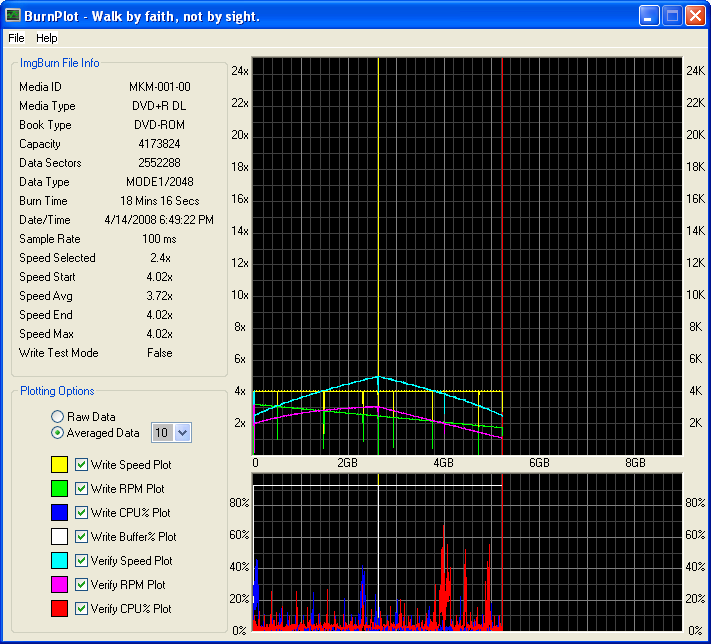 - Still looking for a selection of .ibg files so I can refine my averaging routine and check out the layer break stuff. Thanks. Thanks......I'm just wanting to see the volume identifier (title/movie name) when I bring up the plot...the day/time really doesn't help....especially over time. You say there is a way for ImgBurn to output this to thr graph file ?....can you tell me where/how ?...still kinda a Newb. Also, you may want to put a rev # on your download postings....will help when someone takes a quick look to see if they have the latest. On the 'Graph Data' tab in the settings. I just found..............will this work as setting ? Yes. You can see in the bottom of the preview tab - how it would look.